Located 75 km (46 miles) south of Amman, an ancient city mentioned in The Old and New Testaments housing some of the finest Byzantine church mosaics in the Middle East and the Church of St. Stephen with its perfectly preserved mosaic floor which is the largest in Jordan. The Old and New Testaments mention it, the Romans fortified it, and the local Christians were still embellishing it with Byzantine-style mosaics well over 100 years after the beginning of Muslim Umayyad rule: Kastron Mefaa, modern Umm Ar-Rasas, a UNESCO World Heritage Site, indeed, has a long history to tell. This rectangular walled city, located about 30 km (18.6 miles) southeast of Madaba, lays in ruins, but several buildings in its eastern part, including churches, a courtyard with a well, staircases and beautifully curved stone arches have been excavated and restored. Recent excavations here have uncovered some of the finest Byzantine church mosaics in the Middle East. 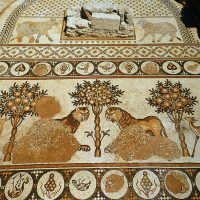 The main attraction, though, lies outside the city walls: it is the newly unearthed Church of St. Stephen with its perfectly preserved remarkable mosaic floor, the largest one in Jordan. It contains the images and portraits of 27 Old and New Testament cities of the Holy Land from both east and west of the Jordan River and of Egypt, making it a discovery second only to the Mosaic Map of Madaba. Less than 2 km north of the fortified town, the highest standing ancient tower of Jordan puzzles the specialists: a 15 meter high, Byzantine square tower with no door or inner staircase, thought to be used by early Christian monks seeking solitude, now inhabited by swarms of birds.